Inscriptions of The Vijayanagara Rulers (1569 A.D.-1682 A.D) is the third in the series of three volumes of Kannada Inscriptions of the Vijayanagara Rulers, prepared under the Inscriptions Programme planned by the ICHR. Under this Programme, a Committee for the compilation of the Vijayanagara Inscriptions was formed with Dr. Shrinivas Ritti as the Convener and the work of compiling the Kannada Inscriptions was assigned jointly to Dr. Ritti and Dr. B.R. Gopal. The first Volume was published in March 2004 and the second in 2008. With this Volume part of the Project relating to the Volumes of Kannada inscriptions is complete. This Volume containing the texts of 148 inscriptions along with their summaries and an Introduction highlighting the information culled out from the inscriptions, pertains to the last phase of the Vijayanagara history. Most of the inscriptions are in Kannada language and script, while some of them, particularly, copper plates, are in Nagari script and partly in Sanskrit and partly in Kannada languages. Region-wise, most of them come from the whole of the present Kannada area. Some of them come from Andhra Pradesh and Tamil Nadu States. It is well known that Indian historio-graphy, particularly for the early part of it, rests almost entirely on epigraphy, augmented, only to a small extent, by literature. The history of Vijayanagara is no exception. Many of the inscriptions published here, have been utilised by earlier scholars working on different aspects of Vijayanagara history. Nevertheless, their value is not diminished. It is the experience of every epigraphist that with every fresh reading of an inscription, new ideas and new interpretations are suggested. These inscriptions provide a variety of rich material and open up new avenues of study. It is hoped that scholars and researchers engaged in Indological studies exploit this material to the fullest extent. Dr. Shrinivas Ritti (b-1929) started his career in the Govt. Epigraphist's Office at Ootacamund (1955-64) and then worked in the Kamatak University, Dharwad, as Lecturer and later as Professor and Head of the Dept. of Ancient Indian History and Epigraphy (1964-89). He also served as a member of the ICHR. His major works include The Seunas (Yadavas of Devagiri) and Volumes of Inscriptions from Nanded, Solapur and Kolhapur Districts. He has also edited A Descriptive Glossary of Administrative Terms in Ancient Karnataka. Dr. Ritti is presently the Chairman of the Epigraphical Society of India. He presided over the 18th Annual Congress of the Society. He was also honoured with a Copper Plate Charter by the Society in recognition of his services to the field of Indian Epigraphy. The Govt. of Kamataka awarded him the Suvama Kamataka Rajyotsava Prasasti for the year 2007. Dr. B.R.Gopal (1930-97) also joined Govt. Epigraphist's Office in 1955. He then joined the Karnatak University, Dharwad (1964) along with Dr. Ritti. Here, both worked on two projects of writing of A Comprehensive History of Karnataka and A History of Ancient India. Dr. Gopal also published 3 volumes of Karnatak Inscriptions. He then joined the Mysore University in 1972 to head the project of revising the volumes of Epigraphia Carnatica and brought out 9 massive volumes in quick succession. In 1986 he joined the Shri Krishnadevaraya University at Anantpur (A.P) as Professor and Head of the Dept. of History, where he brought out a volume of History of Andhra. His book The Chalukyas of Kalyana and The Kalachuris is published by the Kamatak University, Dharwad. Dr. Gopal presided over the 15th Annual Congress of the Epigraphical Society of India held at Anantpur. He was also honoured with the Society's Copper Plate Charter in recognition of his services to the field of Indian Epigraphy. In order to make available to scholars authentic source material which would help research in history the ICHR launched upon a programme several years ago to compile and publish volumes of inscriptions belonging to different periods and regions with appropriate annotation. The programme has made considerable progress and the Council has brought out several volumes of inscriptions edited by noted scholars in the field of epigraphy. A list of these volumes has been given elsewhere in this volume. Since the number of inscriptions pertaining to the history of Vijayanagara is large, it was decided to start under the above programme a separate project to compile separate volumes of available inscriptions in Kannada, Sanskrit, Telugu and Tamil. As a part of this project two volumes of Kannada inscriptions, containing 832 and 913 inscriptions, have already been published and the third one containing 148 inscriptions is now seeing the light of the day. With the publication of this volume all the Kannada inscriptions of Vijayanagara Rulers available till now, have been brought in one place and made available to the researchers in this field. I congratulate Dr. Shrinivas Ritti, the Convener of the Vijayanagara Inscriptions Project for successfully bringing out these volumes in quick succession. A volume containing 589 Telugu Inscriptions of Vijayanagara Rulers, edited by Dr. P.Y. Parabrahma Shastry, is in the final stage of completion. Two other volumes in the same project, Sanskrit and Tamil Inscriptions of the Vijayanagara Rulers, are also being compiled by competent editors and are expected to be published in the course of this year. With the publication of these volumes the project on Vijayanagara will be complete. The present volume edited by Dr. Shrinivas Ritti and Dr. B.R. Gopal covers the period between 1569 and 1682 A.D., comprising the last phase of the empire. Nevertheless, it contains highly useful material regarding the history of a period which was a time of transition from the great imperial epoch to that of smaller chieftaincies which played a crucial role in history later. This volume, like the second one, is being published by the Indian Council of Historical Research through its Southern Regional Centre at Bangalore. I congratulate Dr. S.K. Aruni, Assistant Director of the Centre, who has been very ably handling this responsibility. I have great pleasure in placing before the learned scholars the present Volume of Inscriptions of the Vijayanagara Rulers. This is the third and the last one in the series of volumes of the Inscriptions of the Vijayanagara Rulers, in the Kannada language. The first one was published in 2004 and the second in 2008. The present one is being published now. These volumes together contain as many as 1893 inscriptions in Kannada pertaining to the rulers of Vijayanagara. They provide rich material for the study and interpretation of the history and culture of one of the most important periods in the history of India. This third Volume contains lesser number of inscriptions viz. 148 when compared to the first and second volumes which contain 832 and 913 inscriptions respectively. This Volume covers a shorter period (1569-1682 A.D) forming the last phase of the Vijayangara history. Founded in early 14th century, the empire served as a bul wark to stem the tide of the Muslim invasions in the late 13th and early 14th centuries and played a signal role in consolidating the political power of the Hindus in South India and preserving the cultural heritage which had come down from times immemorial. It saw the height of its glory in the 15-16 centuries register- ing spectacular growth in all areas of human achievements. Due to various political vicissitudes the empire entered into a dark period and, succumbing to the onslaughts of rival forces, finally disppeared from the political scene. Nevertheless, it has left behind it permanent foot-prints on the sands of Indian history. The inscriptions in these volumes record this history in their own limited way. The completion of these volumes has been rendered possible because of the vision and earnest interest evinced by the Indian Council of Historical Research, New Delhi, and the constant encouragement and support received from its authorities, ever since the inception of the Programme. I express my grateful thanks to the successive Chairmen and other authorities of the Council who have overseen this project during the past several years. The present Chairman Dr. Sabyasachi Bhattacharya has bestowed special care on the publication of this Volume because of which it could see the light of day within a short period. Dr. P.K. Shukla, former Member Secretary and Dr. B.K. Pandeya, Co-ordinator, who have been associated with this Programme since its commencement, have taken great interest in the preparation and publication of this Volume also. I take this opportunity to offer my heartfelt thanks to these two friends for the encouragement and support I have received from them from time to time. I am highly thankful to Dr. Ishrat Alam, the present Member Secretary, who has also evinced keen interest in the publication of this volume. I mention here with pleasure another young scholar friend Dr. S.K. Aruni, Assistant Director of the Southern Centre of the Council, but for whose initiative and involvement it would have been" difficult to achieve this goal. It needs to be mentioned here, however, that with the publication of these three volumes the project does not reach completion. These volumes are part of a bigger programme of the publication of the Volumes of inscriptions of Vijayanagara rulers in the other three languages also viz, Telugu, Tamil and Sanskrit. The volume of Telugu inscriptions is now in the final stages of completion and the other two are in the different stages of preparation. It is envisaged that with the publication of those three also, scholars will be enabled to consult as many as over 3500 inscriptions pertaining to the period - a richest harvest indeed for the students of Indian History and culture. I am beholden to the Council for enabling me to handle this project and visualise its completion in the near future. Good number of scholars in South India have worked on different aspects of Vijay an agar a history mainly basing their study on the available source material in their own regions, in local languages and also of course, in Sanskrit. But a consolidated effort is yet to be made by a team of scholars jointly, with their expertise in handling the source material in different languages and to bring out an authentic comprehensive history of Vijayanagara which will be the outcome of first hand analysis of the source material, mutual discussions and arriving at a consensus among them. I hope such a worthy cause will be fullfilled by the publication of the present three volumes and the three to come out in the near future. The Indian Council of Historical Research is really to be appreciated and congratulated for planning and executing such a commendable project of high academic value. I recall on this occasion with gratitude, the help and co-operation rendered by my erstwhile colleague and close associate Dr. B.R. Gopal, formerly Professor and Head of the Department of History, Sri Krishnadevaraya University, Anantapur CA P), in the preparation of these volumes. It is unfortunate that he is not with us to see the fruits of our labour in the form of these volumes. I pay homage to this learned friend, and co-worker and remember him with gratitude for his valuable contributions. The history of Vijayanagara following the battle of Rakkasagi-Tangadigi is like the last act of a drama which ends in tragedy. The said battle wrought havoc in the empire striking a stunning blow at its very roots, never to recover again. The characters at the centre-stage all disappeared and those in the side wings were left rudderless. Some of them at the helm of affairs tried to put together the broken pieces, but to no avail. The responsibility of the disaster has been generally pinpointed by the historians on Ramaraja, popularly known as Aliya Ramaraya, the son-in-law of the famous king Krsnadevaraya. While in some quarters Ramaraya's leadership qualities are appreciated, most writers call him an arrogant, high-handed, over-bearing, ruthless, vainglorious person. Though not all these epithets are to be accepted, the general picture that is given of him is one of a haughty, yet able administrator. Althrough, since the days of his accepting some office under Krsnadevaraya, he proved himself to be a strong military leader, an efficient administrator and a capable manager of the affairs of the empire (karyakarta). Epigraphs depect him as a loyal lieutenant and a righteous administrator. Indications are there, of course, of his showing himself off as an independent ruler occasionally. The circumstances also contributed to this end. After the death of Krsnadevaraya, the palace intrigues and claims and counter-claims to the throne, required a strong hand to control the situation and Ramaraya eminently fitted in it. The primary cause of the fatal battle is supposed to be his highhanded attitude towards the northern neighbours, the four Muslim kings. Disgusted with his attitude the latter are said to have combined together to placate the prosperous empire which obviously had become an eyesore to them. The treachery of the trusted soldiers and the over-confidence of Ramaraya are also said to be contributory causes. Amidst all this it is proper to conclude that the conspiracy of the circumstances together with the inherent defects in the Hindu army and its leader led to this tragedy. It is generally believed that unable to stem the rot, Tirumalaraya, the younger brother and the right hand man of Ramaraya fled for safety to Penugonde along with the royal entourage including the ruling king Sadasivaraya who is supposed to have been the puppet in the latter's hand. It is also said that the victorious Sultans or their representatives camped in the capital of Vijayanagara for full six months looting its wealth to their heart's content and finally deserted it. But our epigraphs tell a different story. As pointed out in Volume IT of this Series Sadasivaraya continued to rule from Vijayanagara for as many as 12 years after the disastrous battle and there are atleast as many as 48 inscriptions in that volume falling in this period. Penugonde no where figures in this period as the capital. It is associated with Tirumalaraya, only after his assuming kingship in that place. The battle had its own long term repercussions. There was no effective central authority to hold the empire together. The more powerful of the nayakas or the heads of the principalities which were freely bestowed upon them as permanent fiefs (amara-nayakatana) together with authority and privileges, started showing signs of exploiting the fluid situation to become independent rulers by themselves. This tendency continued unabated and towards the end of the period covered by the inscriptions in this Volume, we witness the pathetic sight of parcelling out of the vast empire into big and small independent chieftancies engaged more often than not, in mutual rivalries. Such a situation, coupled with the entry of the European elements, the Portuguese, the Dutch and the English, paved way, inadvertantly though, for the emergence of a colonial empire, thus, pushing the Country into the modem period of her history. 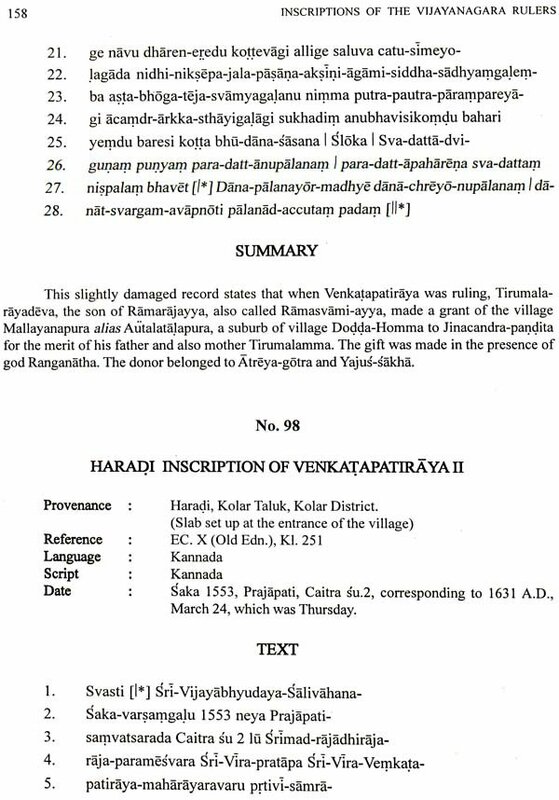 Some statistical details-Inscriptions included in this Volume represent the last phase of the Vijayanagara hagemony which became extinct within a short period. It covered a period of a less than over two hundred years. The number of inscriptions in this period is also very small compared to the inscriptions belonging to the earlier periods. Most of the inscriptions contained in this Volume are normally written in Kannada language and script. There are however two inscriptions (Nos. 85 and 87)1 which are written in Nagari script in Kannada and Sanskrit languages. One inscription (No. 131) is in Kannada language and Telugu script. There are three (Nos. 69, 85 and 87) which are partly in Kannada and partly in Sanskrit language. The geographical distribution of the inscriptions shows how the erstwhile vast empire suddenly shrunk following the battle of Rakkasagi-Tangad igi. The empire which had extended upto the river Krsna in the north now became restricted to the river Tungabhadra. The Raichur Doab which was a bone of contention between the Muslim rulers and the Vijayangara monarchs was now lost to the Muslim invaders permanently. The northernmost point where the inscriptions of this period are discovered is Kampli in Hospet taluk in the Bellary district of Karnataka State on the southern bank: of Tungabhadra, The famous fort of Raichur, Adavani, Mudugal and other strategic places came under the occupation of the Muslim rulers. Politically also this was a lack-Iuster period when the Vijayangara sovereignty was somehow upheld by the seven successive rulers of the Aravidu dynasty, most of whose time had to be spent in fighting with enemies within and outside. Yet it is to their credit that the cultural traditions covering art, literature and religion so fondly fostered by the earlier rulers were maintained to the best of their ability, as the inscriptions in this Volume indicate.